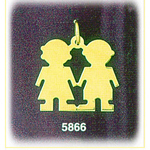 Express your pride in your children with a marvelous 14K Gold Engraveable Triplet Plate Charm. 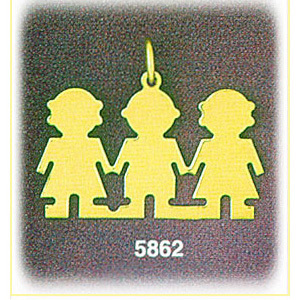 The silhouette of two little girls link hands with a little boy in the middle. 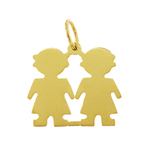 Whether a special treat for yourself, or a gift for a well deserving hardworking mother this 14K Gold Engraveable Triplet Plate Charm is the perfect way to show off your children in style. 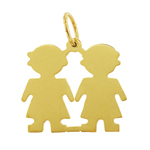 Fashioned out of ravishing 14k gold this childhood charm also features engraving options for a personalized touch. Pendant is crafted in 14k yellow gold featuring a polished finish with flat back, it measures approximately (30mm - 1 1/8") in width by (16mm - 5/8") in height and weighs 2.7 grams, it is recommended for necklaces.